British Gas owner Centrica revealed today that rising commodity costs and freezing weather weighed on its bottom line in the first half of the year as it continued to lose hundreds of thousands of customers..
Centrica’s share price slid more than 5 per cent in early trading, as the firm hinted at further tariff hikes, claiming it would keep its customer prices ‘under review’ while wholesale energy costs continue to surge. 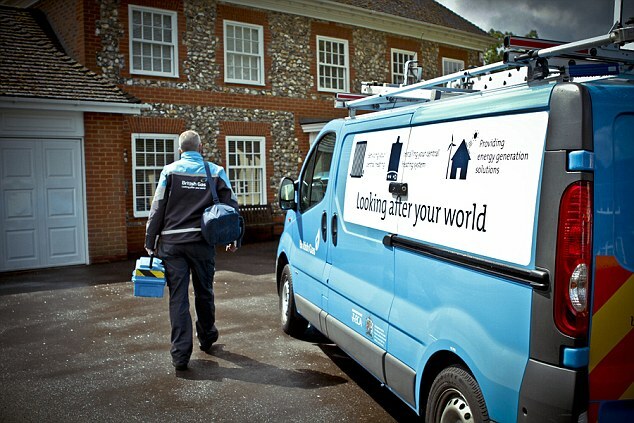 Further hikes would be poorly received, as more than four million British Gas customers were already hit by a price increase at the end of May. But Centrica warned that wholesale costs had risen further since then – a trend that has prompted some of its competitors to follow suit. ‘We are keeping the movement of wholesale energy prices and their impact on our cost of supply under review,’ the firm said. Operating profits at the firm’s household gas and electricity supply arm tumbled 20 per cent to £430m in the last six months as this division was also stung by last year’s pre-payment price cap and the ongoing loss of customers. The results showed that the group lost another 341,000 UK household energy accounts in the first half as customers continue to switch to smaller rivals. Centrica said it was on track to make £200m of savings in 2018, which includes axing 1,000 jobs as part of a wider plan to trim the workforce by 4,000 by 2020. The group, which posted a 4 per cent decline in underlying operating profits to £782m, added that it has ‘plans in place’ to manage a temporary cap on all default tariffs that is set to be imposed.